A fen is a freshwater, peat-forming wetland fed usually by surface and/or groundwater, having a water chemistry that generally is alkaline, and is characterized by reeds, grasses, sedges, and wildflowers. Fens are different from bogs, which are acidic, fed primarily by rainwater (ombrotrophic) and often dominated by Sphagnum mosses. Fens particularly are found in the northern hemisphere. In North America, they occur in much of Canada, the Great Lakes region, the Rocky Mountains, and northeastern United States (EPA 2008). Fens provide important functions, including providing habitat for plants and animals, reducing flood risk, and improving water quality. However, various anthropogenic impacts, such as draining for agricultural, residential, or industrial purposes, have reduced the number of fens. For example, in Great Britain, over 99 percent of the former fens have been replaced by arable cultivation; Wicken Fen is one of only four wild fens that still survive in the enormous Great Fen Basin area of East Anglia. Given their important functions and the fact that it can take up to 10,000 years to form a fen naturally, greater attention is being placed in many countries on their protection (EPA 2008). 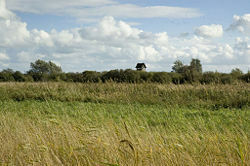 A fen is a type of wetland. A wetland is a transitional environment between permanently aquatic and terrestrial environments that shares characteristics of both environments. Although wetlands have aspects similar to both wet and dry environments, they cannot be classified unambiguously as either aquatic or terrestrial (Barbier et al. 1997). In the United States, the four general categories of wetlands, according to the Environmental Protection Agency, are fens, marshes, swamps, and bogs (EPA 2004). The Environmental Protection Agency defines fens as "peat-forming wetlands that receive nutrients from sources other than precipitation" (EPA 2008) and as "freshwater peat-forming wetlands covered mostly by grasses, sedges, reeds, and wildflowers" (EPA 2004). The National Wetlands Research Center of the U.S. Geological Survey defines fen as "waterlogged, spongy ground containing alkaline decaying vegetation characterized by reeds, that develops into peat" (NWRC 2007). The Environmental Protection Agency defines fens as "peat-forming wetlands that receive nutrients from sources other than precipitation" (EPA 2008) and as "freshwater peat-forming wetlands covered mostly by grasses, sedges, reeds, and wildflowers" (EPA 2004). A fen's nutrient sources generally are from upslope sources as a result of drainage from groundwater movement and from surrounding mineral soils (EPA 2008). The National Wetlands Research Center of the U.S. Geological Survey defines fen as "waterlogged, spongy ground containing alkaline decaying vegetation characterized by reeds, that develops into peat" (NWRC 2007). Peat is a dark, fibrous accumulation of partially decomposed and disintegrated organic matter found in wet areas, and usually comprising residues of plants, including mosses, sedges, trees, and other plant, and even animal, matter. Given that the source of a fen's water is from the surrounding land, the chemistry of the fens reflects the chemistry of the rocks through which the waters flow, such as whether the geological formation is limestone and the water is thus high in calcium carbonate. A fen generally has chemically basic (which roughly means alkaline) ground water. This means that it contains a moderate or high proportion of hydroxyl ions (pH value greater than 7). However, a fen may also be neutral or even acidic. Fens differ from bogs in that bogs are more acidic and have lower nutrient levels (EPA 2008). Both are similar in that they tend to accumulate peat. A carr is a fen that has developed to the point where it supports trees. It is a European term, mainly applied in the north of the United Kingdom. Carr is the northern European equivalent of the wooded swamp of the south-eastern United States. It is a fen overgrown with generally small trees of species such as willow (Salix spp.) or alder (Alnus spp.). A list of species found in a fen therefore covers a range from those remaining from the earlier stage in the successional development to the pioneers of the succeeding stage. The word "fen" is derived from Old English fenn and is considered to have proto-Germanic origins, since it has cognates in Gothic (fani), Old Frisian (fenne), Dutch (veen), and German (Fenn(e), Venn, Vehn, Feen, Fehn). The water in fens is usually from groundwater or flowing sources (minerotrophic) with a fairly high pH (base-rich, neutral to alkaline). Where the water is from rainwater or other sources with a lower pH (more acidic), fen is replaced by vegetation dominated by Sphagnum mosses, known as bog. The less acidic and higher nutrient levels of fens, versus that of bogs, means that fens are able to support a considerably more diverse plant community (and animal community) (EPA 2008). Whereas bogs are dominated by mosses, fens often are covered by rushes, sedges, grasses, and wildflowers (EPA 2008). Some fens have parallel ridges of vegetation that form perpendicular to the downslope flow of the water, with less productive hollows separating these ridges (EPA 2008). Where streams of base-rich water run through bog, these are often lined by strips of fen, separating "islands" of rain-fed bog. A fen was once thought to be a phase in the natural succession from open lake, through reedbed, fen and carr, to woodland, or as the peat develops and its surface rises, to bog. Indeed, peat may build up over time and separate the fen from its groundwater supply; as the fen receives less nutrients, it may become a bog (EPA 2008). However, it is more generally recognized that fens tend to be persistent habitats whose existence is dependent on the availability of water. Fen also merges into freshwater marsh, when it develops more in the direction of grassland. This is most likely to occur where the tree species of carr are systematically removed by man for the development of pasture (often together with drainage), or by browsing wild animals, including beavers. The following is a list of plant species to be found in a north European fen with some attempt to distinguish between reed bed relicts and the carr pioneers. However, nature does not come in neat compartments so that for example, the odd stalk of common reed will be found in carr. Environmental Protection Agency (EPA). 2006a. What are wetlands?. U.S. Environmental Protection Agency. Retrieved December 31, 2008. Environmental Protection Agency (EPA). 2006b. Wetlands definitions. U.S. Environmental Protection Agency. Retrieved December 31, 2008. Environmental Protection Agency (EPA). 2004. [Wetlands overview. U.S. Environmental Protection Agency EPA 843-F-04-011a (December 2004). Retrieved December 31, 2008. Environmental Protection Agency (EPA). 2008. Fen. U.S. Environmental Protection Agency EPA 843-F-04-011a (December 2004). Retrieved December 31, 2008. Natural Resources Conservation Service (NRCS), United States Department of Agriculture. 2007. National Soil Survey Handbook: Glossary Of landform and geologic terms (Part 629) NRCS USDA. Retrieved December 31, 2008. Rose, F. 1989. Grasses, Sedges, Rushes and Ferns of the British Isles and north-western Europe. New York: Viking. ISBN 0670806889. This page was last modified on 19 January 2009, at 03:48.